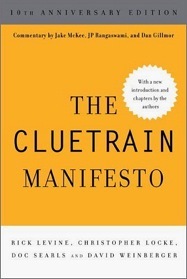 Ten years ago The Cluetrain Manifesto was a website that had been up for a couple of months — long enough to create a stir and get its four authors a book deal. By early June we had begun work on the book, which would wrap in August and come out in January. So at the moment we’re past the website’s anniversary and shy of the book’s. 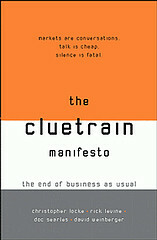 That’s close enough for 10th Anniversary Edition of The Cluetrain Manifesto, which will hit the streets this month. The new book, which arrived at my house yesterday, is the same as the original (we didn’t change a word). but with the addition of a new introduction by David Weinberger, four new chapters by each of the four authors (Chris Locke and Rick Levine, in addition to Dr. Weinberger and myself), and one each by Dan Gillmor, Jake McKee and JP Rangaswami. A lot has happened in the last decade. A lot hasn’t happened too. To reflect on both, the Berkman Center will host a conversation called Cluetrain at 10: So How’s Utopia Working Out for Ya? at Harvard Law School. David Weinberger and I will be joined by Jonathan Zittrain, a Harvard Law professor and author of The Future of the Internet — and How to Stop It. “JZ” was a student at HLS when he co-founded the Berkman Center eleven years ago. David and I are both fellows at the center as well. The three of us will talk for a bit and then the rest of it will be open to the floor, both in the room and out on the IRC (and other backchannels), since the conversation will be webcast as well. It starts at 6:00 pm East Coast time. Meet/meat space is the Austin East Classroom of Austin Hall at Harvard Law School. It’s free and open to everybody. Since it’s a classroom and expected to fill up, an RSVP is requested. To do that, go here. Will the additional chapters be published online, in true Cluetrain fashion? BTW, I read the original website 1999 and several years later bought the book – giving stuff away can increase sales, as you know. Damn, I wish I could be there! If so, I would certainly lean heavily on the fact that, of the four original self-styled firebrand revolutionaries, one is now making fancy chocolate for a living, one is a grumpy old recluse who spends his days telling bad jokes on Facebook (that would be me), and two have been co-opted into the ultimate bastion of The Establishment. Meanwhile, Olivia Munn (!!!) is about to do a whole-day extravaganza on Hulu celebrating the blessed advent of Microsoft’s new advertising platform, Bing. It’s good to know we’ve made a difference. Awesome, ordering a copy now! Cluetrain has been a huge part of my business life! Can’t wait to read the new stuff and re-read the old 🙂 again. Hi Doc, I wish I could be there! And cool that you publishing a new version. AR on your mobile will be a logical way for VRM to interface on the go between individuals and sellers. Ah, Chris, wish you could be there too. But why be present in spirit when there’s always the backchannel. Tweet it or come in through #berkman on IRC… or … we should think of something. Would you come to CalTech to do one of these? Sally, if by “one of these” you mean a talk, I’d be glad to, when I’m back in Santa Barbara. In fact I gave one there just a couple months back, at the CalTech MIT Enterprise Forum. The audio is here: http://www.entforum.caltech.edu/program_audio.htm It wasn’t Cluetrain-related, though. Anyway, I love CalTech and would be game. Hey you! Wish you’d come home to CA. You’re missed. Like Chris, I really wish Doug and I could be at this gathering. It would be fun to be at the 10th especially since we were at the rollout talk at Siggraph with you and David. ‘Can’t believe it’s been 10 years. I’ll camp on via the webcast– Why not set up a Skype connection for Chris so he can participate? If you decide to do anything at CalTech– let me know. I want to be there. I am amazed at the very few comments this post actually received. The Cluetrain Manifesto is just the only Bible of social media marketers, whether they’re aware of it or not, this book has guided marketers, organizations, entrepreneurs and society in ways we can’t even imagine. What would the world be without it? Who would have helped marketers understand the new power of conversations? Thank you so much for sharing this knowledge, without this book, I would not be standing where I am at this very moment (Im a social media consultant), and I just wanted to show you Dr Searls and colleagues, my profound gratitude for the sharing of this clue train. I am buying the 10th anniversary book today because I want to know what’s next! Thanks, timdl. Sorry this didn’t get posted sooner. It got caught in a part of my spam sieve that I don’t often check. Actually, this is a high number of comments for this blog. I don’t know why, but my posts here tend to be widely read but not highly commented-upon. Tweets pointing to them often outnumber comments. Not sure why. Thank you for your kind answer Doc. I have to admit that since I put your book so high in my esteem, and know so many people (web 2.0 entrepreneurs, consultants etc.) who continuously refer to it when pitching, teaching, or just working, that I just assumed this post should have gotten a huge amount of comments. This being said 18 comments is way more than I could ever get for one single post, and is surely a high number. I just thought it deserved more, honestly. Thanks again for the work.